Let me share a little something with you: Tumblr scares me. The reason for that is simple: I don’t know a single sane person who’s on there, and most of the stuff that Tumblr spawns is related to some weird fandom I just can’t wrap my head around (why do all you geek girls love Tom Hiddleston so much?!). Some people warn you of 4chan’s /b/, but I warn people of Tumblr in its entirety. I want to use this week’s Geek Jitsu to discuss this list, since I think that this is relevant to many a geek trying to live healthy. In a subculture where both genders are heavy sexualized in our media of choice, be it games, movies, tabletop RPG’s or the likes, it’s easy to associate many superficial physical features with health. The list above should be a helpful reminder to you, but I still want to work it through, point by point. The first three items on the list: I summed up my opinion about that pretty well in another edition of Geek Jitsu, so there’s nothing left to say. Rips and hip bones aren’t meant to be visible: while some of us are just bony by nature, most geeks will have a normal physical appearance. 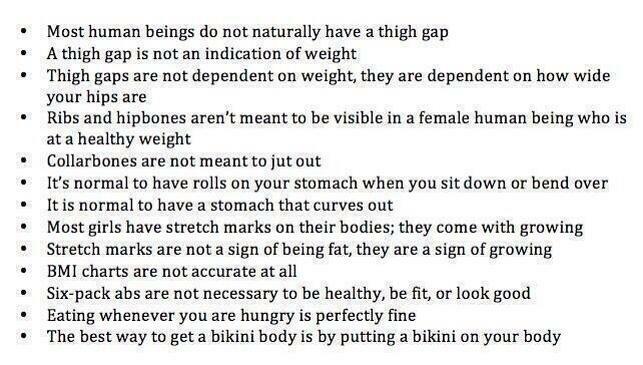 That includes the fact that your rips and hip bones shouldn’t be showing. If they do, you might consider actually gaining some weight. Collarbones are not meant to jut out: unless you’re Benedict Cumberbatch, everything I said on the previous point applies here as well. It’s normal to have rolls on your stomach when you sit down or bend over: how also would you want to bend over then? D’you want your belly to be just in the way? Trust me, nature got you covered, even if it makes you look like you’re a walrus. Trust me, you’re not! It’s normal to have a stomach that curves out: it really is. Of course, there’s a difference between a curved stomach and carrying around a keg of concentrated fat, but I’m assuming that my readers are smart enough to spot the difference. Both points about stretch marks: this doesn’t just apply to girls. As a guy with a stretch mark-covered belly, I know how annoying and ugly they can look. However, after thinking about it, there’s nothing to be ashamed about. As the picture says, stretch marks come from growing, but they do also appear when you lose weight. Your skin is a bit loose there, still used to the amount of fat it had to cover. This makes your stretch marks badges of honor, showing the world how you won the fight against yourself. Wear them with pride, and have the world know that you are a symbol of physical change! BMI charts are not accurate: thank you for supporting me here, list! I keep telling people the BMI is no accurate way of telling if you have a healthy weight or not. It leaves out too many factors (like muscles) and will only depress you. It’s a nice general indication, but not the doctrine that should control your life. Six packs abs are not necessary: though my vanity would like to disagree, my logic has to agree with this points. Having good-looking abs is nice and great to impress the ladies, but they are no prerequisite for a healthy body. If you want a six-pack, go out and get it, but don’t believe that others can’t look good without one. Eating whenever you are hungry is perfectly fine: though I technically agree, I would like to point out that you should get to know the difference between being hungry and just wanting to eat. I’ll discuss that in another installment, but you can already think about it. Nevertheless, starving yourself doesn’t grant you a super-powered body, it only shows how stupid you are. The best way to get a bikini body is to a put bikini on your body: power to everyone who just does that, but be ready for some backlash! That’s my two cents about this list. Generally, I think it’s a good idea to keep it somewhere visible, as a helpful reminder and a good set of guidelines. Thank you, Tumblr, for providing me with something not-fandom-related and / or really scary. I actually don’t think Tumblr is too scary. Sure I stumble upon the occasional weird stuff on there, but for the most part it has people who happen to be…um…super passionate about the fandom that they are psyched over? Great article though! The list you found is weird, but I like how you put your own two cents about each one and made some sense of it. As for the last item on the list, yeah you can just put a bikini on your body, but there are just some things better left unseen. This post made me feel a lot better about that giant scar that the doctors call my belly. I have pretty sensitive skin, and my weight peaked at about 95 kilos, causing me to get a monumental amount of stretchmarks. I’ve lost about 23 kilos since then, and actually managed to keep that weight loss for 5 years now.